We MUST call our Congressman & Senators everyday about the pipeline!! Blocking this decision on the keystone pipeline is a grave mistake on the part of the government. Whether it decides to go through with the measure or not, people need jobs now, not later. They Keystone pipeline while of course up for discussion, would provide jobs to a lot of people who are seeking active work . To delay this decision puts much of their employ-ability and economic stability at risk. 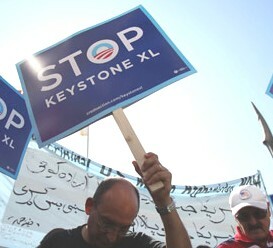 None of the articles I have found say "Why president Obama is against Keystone"? Does anyone know why he is against it ?